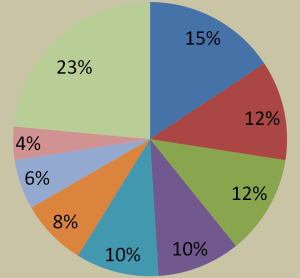 In 2013, our Corporate Marketing team launched a driver motivation survey at Bison. 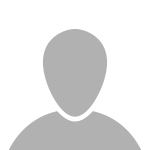 But our goal wasn’t to find out whether professional drivers were motivated or not, instead we wanted to find out specifically what motivated them and how they chose a carrier to drive with. We have now surveyed over 1,000 drivers and learned some interesting things. For one, the majority of drivers chose their career path due to the earning potential. Secondly, we found that our safety programs, policies and reputation were among the top reasons Drivers chose Bison. That made a lot of sense since Bison is North America's Safest Fleet. In an effort to extend our fact-finding mission beyond Bison, we created the #TellBisonWhatDrivesYou campaign on Facebook. This campaign would give professional Drivers – both with Bison and other fleets – the opportunity to share what drives them day in and day out. Additionally, one of the biggest challenges the trucking industry has, especially when trying to recruit drivers, is the negative stereotype and misconceptions of the industry. No job is for everyone but being a professional driver is an incredible opportunity and should be highly respected by the general public. Truck drivers are professional, highly skilled and work very long hours to support our economy and our way of life. With this in mind, a major objective of our campaign was to provide a venue to feature great stories and highlight the many benefits to be gained from a career as a professional driver. 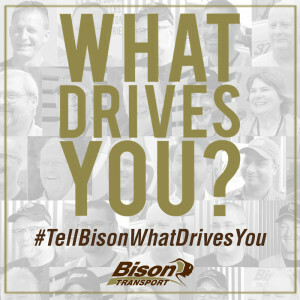 From January 1st – 31st , people were asked to share what drives them on our Facebook page and use the #TellBisonWhatDrivesYou hashtag. We promised to share the results and award one of the participants a coveted Bison Transport die-cast tractor and trailer! Pay was mentioned but it was way down the list. While compensation is important, it was clear that drivers placed greater value on many other benefits. Truck driving appeals to many different types of people. We heard from men and women of all ages and backgrounds. There are not many careers that can be such a good fit for such a diverse group of people. No two motivations were the same, which enforces the notion that we can't assume all truck drivers are motivated by the same thing. For some drivers it's pay, some it's respect and others it's knowing that they are making a difference. As a carrier, we need to create many different benefits for our Drivers. We were pleasantly surprised by how detailed and thorough many of the comments were. Drivers really put a lot of thought into their responses and spoke from the heart. One driver was an IT grad and makes more money on the road than he ever did in an office. Another driver shared how he has gained "street-smarts" from 33 years as a professional driver. Several drivers commented about professional skill development over their careers. The genuine and detailed nature of the responses was the aspect of the campaign I am most proud of. Please follow this link to see all of the responses! Thank you to everyone who commented and was involved in this campaign. We had such great feedback that we decided to give away a second die-cast truck - one for a Bison Driver and one for a non-Bison driver! Congratulations to Cass NicBridhe and Jocelyne Yanofsky on winning a die-cast Bison truck!